Shopping for Green Arrow Action Figures? Classic action figures on the packaging made famous at Kresge! Amazing 8-inch action figures just like the ones you remember. Bring home your favorite world-famous super heroes from DC Comics! Retro action figures are back with the classic Kresge packaging! 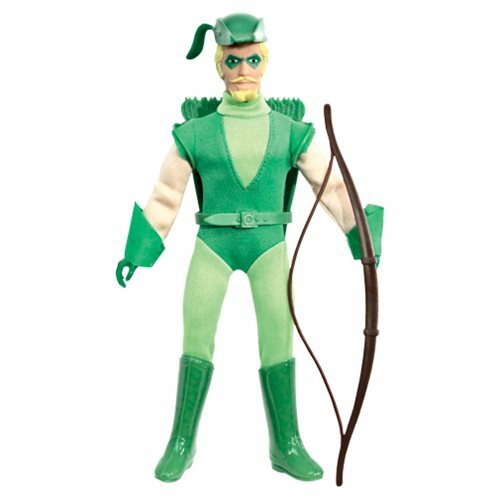 The DC Comics Kresge Style Series 2 Green Arrow 8-Inch Retro Action Figure is inspired by the classic Mego figures of old, sporting cloth outfits and classic heads complete with the variant packaging you remember! Inspired by the Kresge packaging which was a little bit narrower and had a unique design, each figure comes to bring a smile to your face. Ages 14 and up.